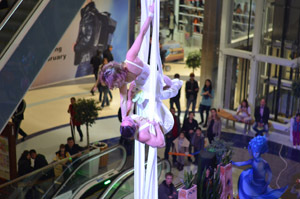 Primavera duo had the honor to present its number on the silks, at the opening of the shopping center international Mega – 2 in Alma-Ata ( Kazakhstan ). MEGA-2 Alma-Ata, the biggest shopping and entertainment mall in Kazakhstan, was opened in 2013 in Alma-Ata. At the moment the mall is the favourite place of both residents of the city and visitors for shopping and relaxation. On a weekday MEGA-2 Alma-Ata mall is visited by 30,000 people on average. On weekends that number is double. There is a food hypermarket, a consumer electronics shop, over 100 boutiques selling world famous brands, a huge food court, an 8 screen multiplex cinema, a climbing wall, a skating rink, an entertainment park for children, bowling and much more. MEGA-2 Alma-Ata was designed with careful attention to the seismic dangers of the area without compromising the architectural attractiveness of the building. biggest shopping and entertainment mall, duet primavera, Mega - 2, Mega - 2 in Alma-Ata, silks. Bookmark.